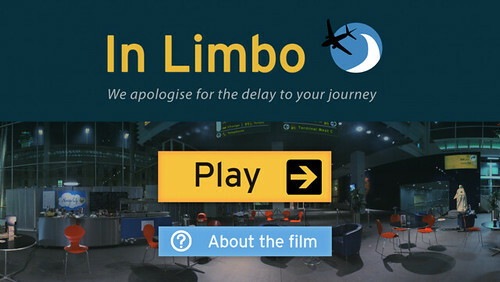 In Limbo is a short interactive film for the iPhone (4 and above), writes Clare Walters. 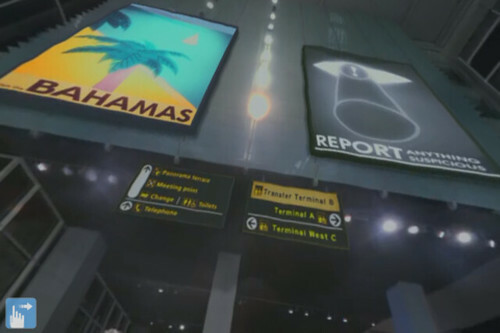 To watch it, you use your phone like a camera, observing human behaviour in ‘Terminal 8’, a fictional airport departure lounge. Leo Bridle and Leo Powell, the film-makers behind In Limbo, believe their experiment is a first. It presents a 360° circular panorama with interactive sound. The stereo soundtrack – best experienced on headphones – changes according to the action you are watching from the central vantage point. Conversations, arguments and background sounds fade in and out of earshot as you move the phone or scroll the touchscreen. There’s a further 180° of vertical movement, which means you can pan upwards to the departure boards, signs and ceiling, or down to the black circular table, bare but for a takeaway coffee cup and boarding passes, from which you are invisibly watching the action. 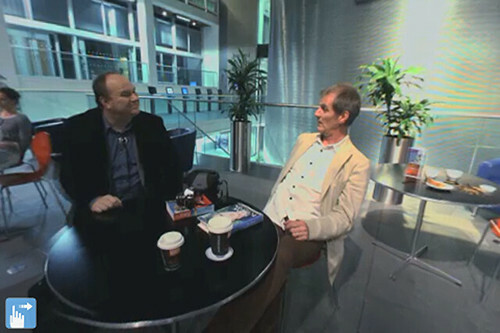 In Limbo, directed by Leo Bridle and Leo Powell. Top: looking towards the departure gate – and a family argument. Looking ahead: the airport café. Watching In Limbo can be different each time – you can choose an alternative group of characters to follow … and learn their secrets. Maybe you’ll stick with Paula, an air hostess who is paying a surprise visit to her boyfriend Dan. Swivelling in another direction reveals a shifty-looking Dan in tense conversation with a pregnant woman. Or perhaps you’ll focus on the suspicious guitar case that seems to contain something other than an instrument, or the photographer, whose relaxed manner irritates a Texan businessman. 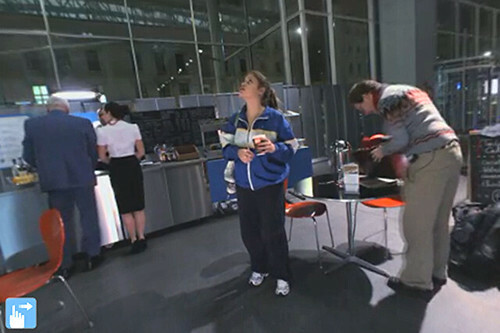 There’s a sizeable cast, including an exhibitionist jogger, a bickering family with their bored son Josh, a solitary chess-playing pilot with problems of his own, Baldeep, the patient café proprietor – and a busy airport security guard. Bizarre love triangle. Paula and her boyfriend Dan – but who’s the pregnant woman? Meanwhile, a separate drama unfolds as you pan to the right. Young Josh finds a way to entertain himself. The concept of multiple stories that run alongside each other and occasionally overlap or intersect is not a new one. 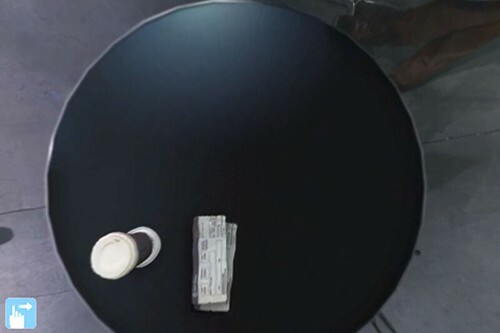 It can be seen in several Robert Altman movies, including Short Cuts (1993); in Alastair Graham’s wordless Full Moon picturebooks (see Eye 85); in avant-garde ventures such as Marc Saporta’s loose-leaf novel Composition No. 1 (see Eye 81); in Zbigniew Rybczyński’s surreal 1980 video Tango, with 36 different characters in a single room; and in computer games that require the player to interact with multiple storylines, from the early Colossal Adventure to Grand Theft Auto. Fractious Bob from Texas and photographer Frank. At the centre of In Limbo’s universe. However the viewer of In Limbo is invisible, tethered to a table at the centre of the space. All the actions are the same on each play-through, but it’s you, viewer, who chooses where to look. Revisiting the idea of multiple storylines within an app format brings a freshness and vigour to the concept that could be expanded to longer, more complex plotlines, different kinds of interactivity … the possibilities are tantalising. Weary Baldeep chats to Frank. In Limbo. 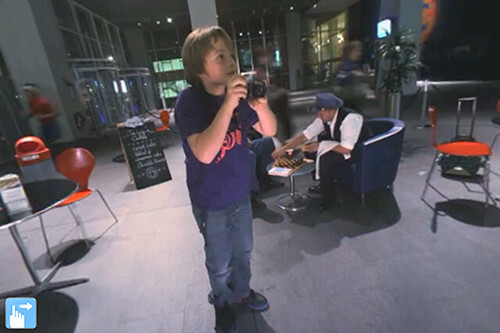 A 360° short film, Full Circle Interactive Ltd. Free iPhone app. Credits: written and directed by Leo Bridle and Leo Powell. Produced by Full Circle Interactive. Sound by Hammersnail Sonic Research. App development: The Workers. Director of photography: Maria Lax. Promotional Vimeo video by Leo Bridle. Clare Walters, journalist, author of children’s picturebooks, London.